Will Millennials ‘grow out’ of sharing? Survey participants were encouraged to: “Explain your choice and share your view about the future of human lifestyles in 2020 – what is likely to stay the same and what will be different? Will the values and practices that characterize today’s younger Internet users change over time?” The following is a small selection of the hundreds of written elaborations, organized according to some of the major themes that emerged in the answers. A fundamental shift is occurring in human identity and activity in communities. As often is the case, some of it is driven by social change that is facilitated by technological change, especially the new capabilities offered by mobile devices. The benefits to people of sharing information and disclosing details about themselves are becoming more evident. These perceived benefits will change over time as Millennials’ interests change, but the general pattern for disclosure will remain. The historic pattern is for each generation to change the boundaries of privacy and identity. It is true that Millennials have what might be considered by some in today’s society to be liberal views about sharing their information, but the privacy paradigm is evolving and people may be more forgiving of others’ indiscretions in the future. “The e-world will become more open and less private, but the excess of today’s college students will diminish with age and responsibility. However, as they age, they will be much more open than their parents have been.” —Don McLagan, member of the board of directors for the Massachusetts Innovation & Technology Exchange, consultant, retired chief executive officer of Compete, Inc.
“Clearer lines between appropriate public and private information will emerge as more people are burned legally, professionally, and socially by what they make available online, and by what remains available even though they grow up and move on.” —Tom Wolzien, founder and chairman of Wolzien LLC Media & Communications Strategy and formerly senior analyst with Sanford C. Bernstein & Co. This is not so much a generational story as a story about the impact of technology on overall human behavior. It relates to deep human desires to be social and to be in control of identity. New technologies will continue to make this much easier to do. The notion of privacy was powerful in the industrial era during the rise of “mass society.” We live in a time in which the need for privacy and the advantages of privacy have given way to the needs of “networked society,” and advantages are found for all in sharing details in social media. When this generation comes to power in government and corporate settings social norms will be more formally adjusted. “They will not have grown out of being ambient broadcasters, because being ambient broadcasters will have become the norm when they are totally in charge.” —Jeff Branzburg, consultant with Teaching Matters, Inc.
“This way of being is completely ingrained in their DNA now. The challenge will be for older generations to accept that expectations on sharing have changed, and to modify behavior and employment norms to take this into account.” —Chris Jacobs, chief operating officer, Solutions for Progress, Inc.
“While I agree that those who are young today will outgrow their penchant for sharing, there will always be a new class of young people who are exploring the world and in so doing will share without concern for future consequences. 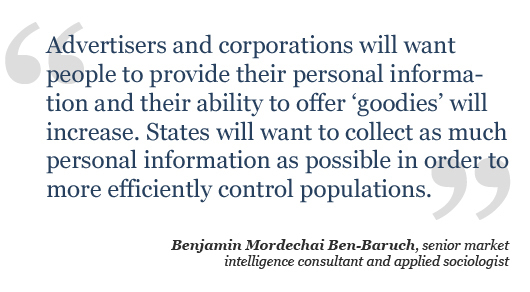 We need to adapt our privacy and data gathering to accommodate this. We ought to require search engines, such as Google, to purge their dossiers on people when those people hit their 25th birthday.” —Karl Auerbach, chief technical officer at InterWorking Labs, Inc.
Millennials will eventually calibrate the level of detail they provide various audiences in their lives. The things they disclose will also change as they get older and their interests change. 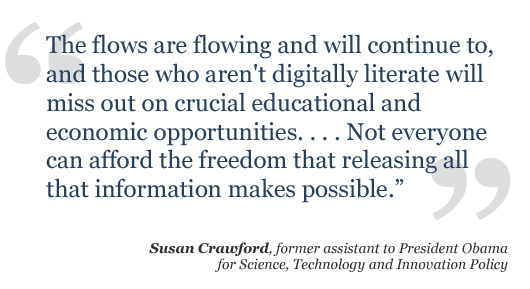 Nuanced behavior about what information to share and whom to share it with will become more prevalent. Disclosures might become more tame. 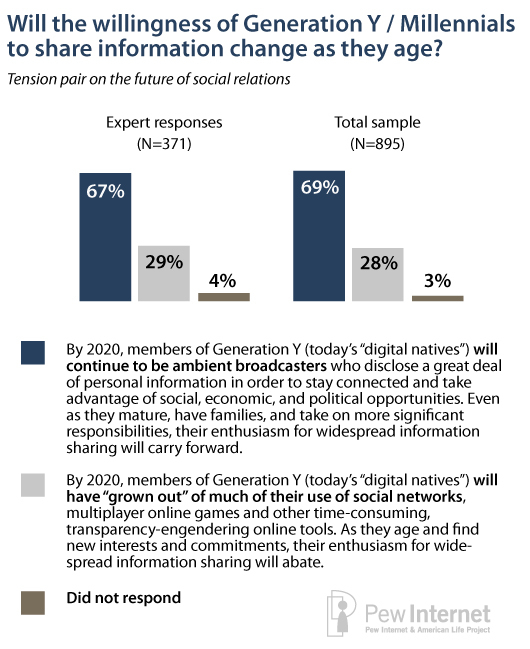 New social strategies – and a new “netiquette” – will also emerge as this generation figures out the social advantages they can gain by selective disclosure. “The ‘digital natives’ will mature and find other interests which will likely change the intensity of their online activities, though not their willingness to use online tools. The younger Internet user will likely become more selective in online use over time, but not negative toward its use.” —David Olive, vice president of policy development support for ICANN; formerly general manager, Fujitsu America, Washington, D.C.
Privacy is less meaningful to Millennials and their changed norms will stay with them, perhaps in new forms. Social styles get imprinted in people early, though social strategies change. Millennials will not revert to the traditions of their parents and grandparents when it comes to being public actors. The yearning for privacy will seem an artifact of the past. And their lifestyles will influence their elders’ and institutions. Governments and businesses with an interest in promoting people’s open sharing of personal information will play their own role in encouraging Millennials to broadcast personal information and in adjusting to these new realities. Time pressures will eventually assert themselves. It takes a lot of effort to broadcast your thoughts and whereabouts and the demands of busy lives will cut into Millennials’ interest in sharing so much detail about themselves. Growing older does have some influence on behavior and will continue to do so. Some privacy practices are too valuable to give up. New digital divides will occur as those who are comfortable with gadgets have reputational and productivity advantages over those who are not as comfortable – or those who cannot afford the gadgets.